I have been busy for the past two days as I busy arranged Lucas's 10years old Birthday party. First I would like to share with you the Ocean cup cakes that I baked for this Birthday party. The main Birthday cake is followed Ocean theme, thus the cup cake also followed the same theme. 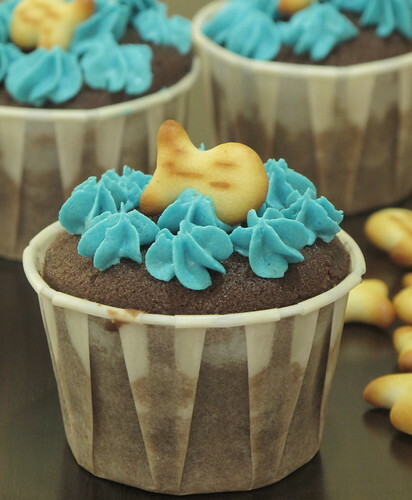 I use fish cookie to decorate this cup cake, this fish cookie used to be my favourite when I was a kid, I used to buy this from pasar (market), love the slightly salty taste. Is this also your favourite cookie or you have never seen this kind of cookie before? 1. Sift baking powder, baking soda and cake flour together, set aside. 2. Beat butter with the sugar until fluffy. 3. Add in egg one at a time, mixing well. 4. Fold in the flour, milk and heavy cream, combine well. 5. Last add in cocoa powder and coffee powder, combine well. 6. Pour mixture into a paper cup till ¾ full. 7. Bake in pre-heated oven at 180C for 20mins. 2. Add in sugar and vanilla, beat till fluffy. 3. Add in heavy cream, combine well. **in my next post, I will share with you the main Birthday cake, a ocean cake, stay tuned. Beautiful decoration! I love the fish cookies too. About the flour I used to make tortilla, you can use AP or bread flour instead. I am always late to leave comment! >=<... hahaha... where do you learn all these cooking and baking from Sonia? they look really awesome!!! very well done! waw! Since my girl is having pool party this coming Sat,i think i will try this out for her. But i hav to try my very best to get the fish biscuit first. Sonia, u are awesome! Really want to call u si fu liao. Well decorated cup cakes - Sonia, you are getting better. Good ideas to decorate cupcakes with titbits! So cute! Also perfect for my upcoming beach trip!! My girls will love this! Your cupcakes are adorable with their little fish on top! Can't wait to see the main cake! I hope son had a wonderful time at his party. He must be really happy with the cake you baked for him. 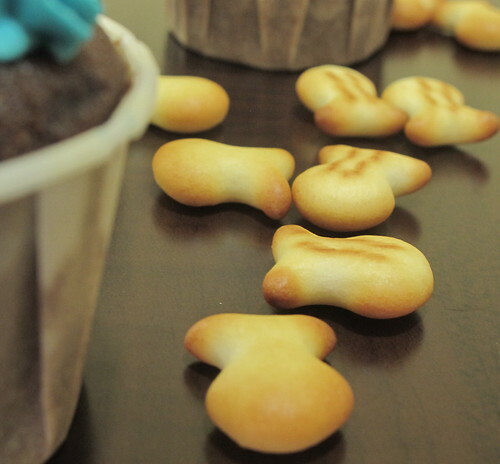 I like the beautiful shot of the fish cookies. Cup cakes look so very cute. Great idea to use the fish cookies. Lovely presentation and happy birthday to your son! I like the photos and the blue butter cream on top of these Ocean Cup Cakes . oh wow adorable Jasmine says phish! These are darling! Happy Birthday, Lucas! I want to see the birthday cake!!! Nice choice of colours....I am sure the kids would love these at the party! Mmm.. they look so good! And so pretty! 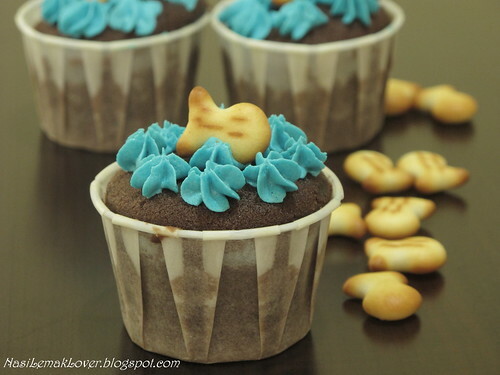 Ocean cup cake with fish cookies, cute! I bet this is really good! Lucas is so lucky to have a mom like you! Dear all, Thanks for stopping by and your lovely words! Have a nice day. I LOVE this cake! I think it is so special to make your own birthday cakes!! It is such a labor of love!!! Beautiful memories for all! I saw these on Tastespotting. They are really pretty and I am sure your boy loves them. That blue.. Steamed moist chocolate cake_simply good ! !